A view of the Rose Pavilion in the Royal Botanic Gardens, rising up to the Sydney skyline in the background. The pavilion is flanked by two Marble Lion sculptures. 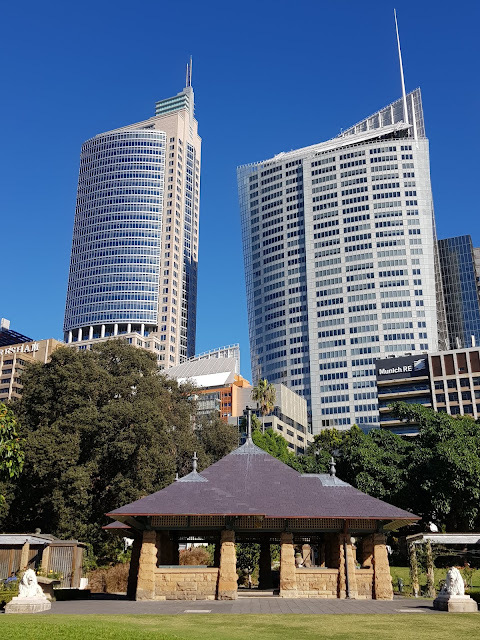 The towers above are Chifley Tower on the left and Aurora Place on the right. What a great contrast in architecture! What a stunning sight and contrast! Pretty skyline under beautiful blue skies! Your earlier photo of the Rose Pavilion in the Royal Botanic Gardens was much softer - both the view through the flowers and the pavilion roof. The flowers are gorgeous. I prefer by far the cute little Pavillion to the ugly towers behind ! What a contrast !! What a gorgeous spot. I love all the "two-fers." But was wondering if those towers are residential or commercial buildings. Your city is so beautiful! Lowell, the high rise buildings are commercial offices but some of the low rise ones are residential buildings. What a clear blue sky, it's beautiful! I like the buildings and lions to. Love this view Jim. It always seems a little surreal being in the serene surrounds of the Botanical gardens, looking up at these skyscrapers! That amazing blue sky! Wow!